ProCom intercom systems offer safe and effective communication, even in harsh and noisy environments. Our high-quality systems comply with the most stringent safety requirements, enabling proactive safety management and ensuring reliable process communication. 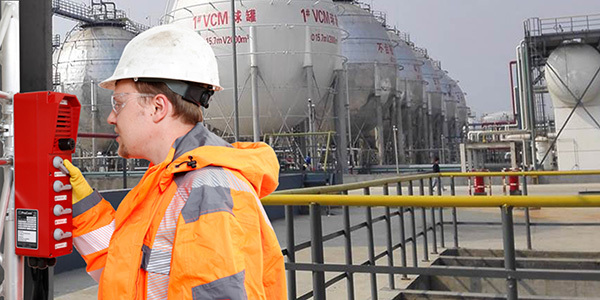 Fast, safe and clearly understandable communication is essential – no matter whether the user is located at a blast furnace, on an oil platform, in a potentially explosive area, in a chemical plant, in a railway signal box or a shunting yard. Rapid connection set-up is the key to process communication. Push-to-talk technology enables direct connections with pre-programmed destinations to be set up in a matter of milliseconds. Fast, targeted communication helps danger to be avoided, errors to be reduced and processes to be optimised. The high quality of our components and the continual monitoring of our two-way communication systems assures the highest levels of reliability and availability. In addition, our products have all the required certification and comply with national as well as international norms and standards. The modular system architecture of our systems enables them to be adapted to your specific requirements perfectly – as well as as allowing expansion with additional components at any time. Holistic communication solutions are also facilitated by the integration of public address and alerting systems as well as interfaces for control centre technology and other systems such as fire alarm installations, PABXs, etc. We offer an optimal voice communication solution that is tailor-made specifically to your requirements. Contact us – we look forward to measuring up the challenge!